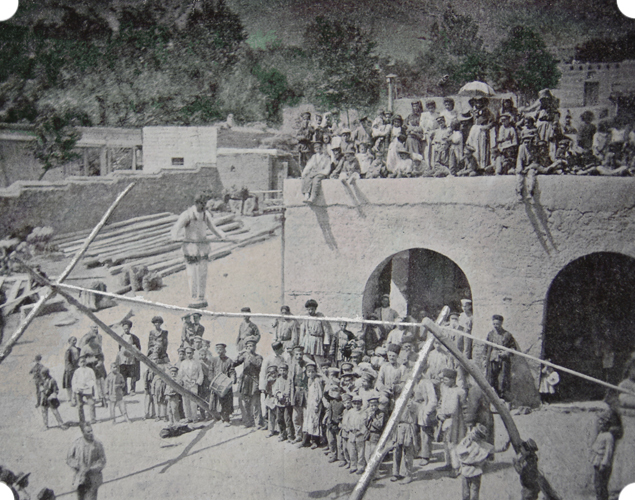 We can see, through the games played in Harput, various details of the ways that local society lives. In reality with this subject we describe sometimes very simple games, the like of which we can find in the past in many societies all over the world. 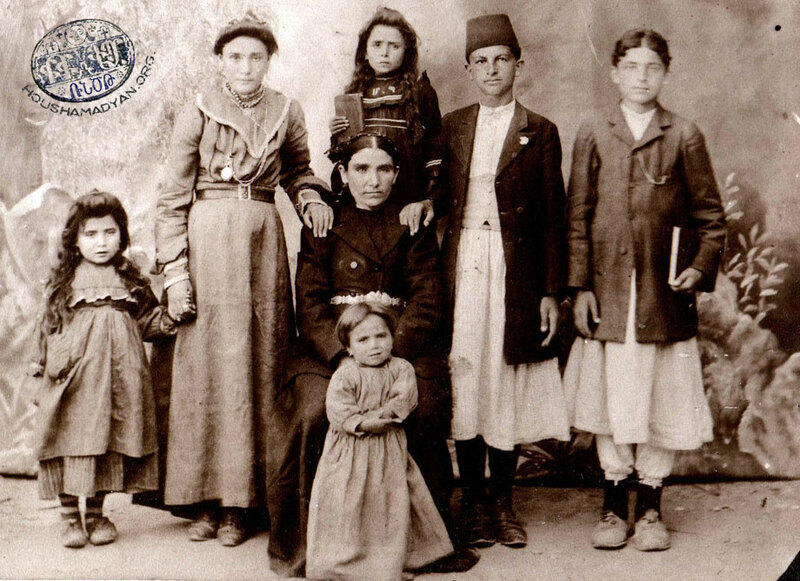 But this same subject is also an opportunity to examine the more intimate times of the Armenians of the plain of Harput, their minor pleasures and pastimes - things that make the daily life of the Armenian of Harput more understandable - and the ruling social factors there. It is interesting, for example, to see the abundance of games. 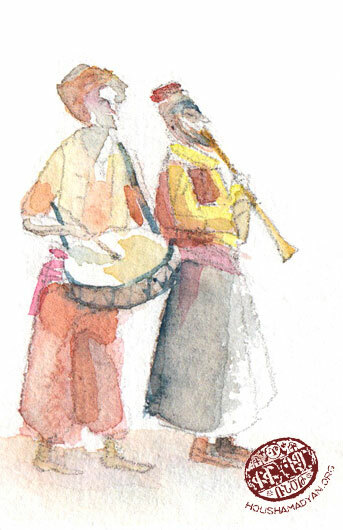 They are often played in the villages and have either local dialect or Turkish names. It is possible that this is enough proof to think that such games have existed among the people of Harput from earlier times. It is therefore wrong to think that they have started to be played in local society in the 19th century, with the arrival of western missionaries. Games are often played by boys and girls together, something that is also an interesting expression of local ways of living. Wrestling is also especially notable. In modern-day Turkey this is presented as a national sport and considered to be a real legacy of central Asia. 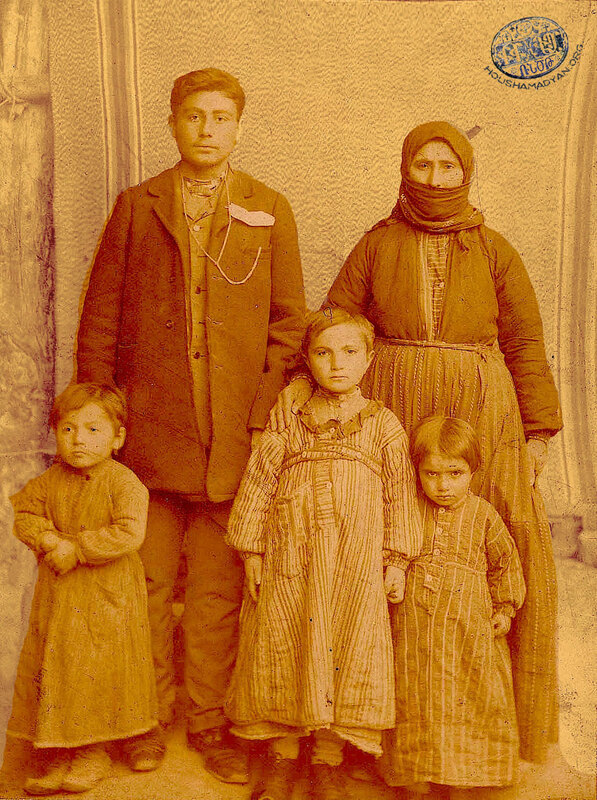 There are many Turkish myths linked to it which emanate from those nationalist sources. 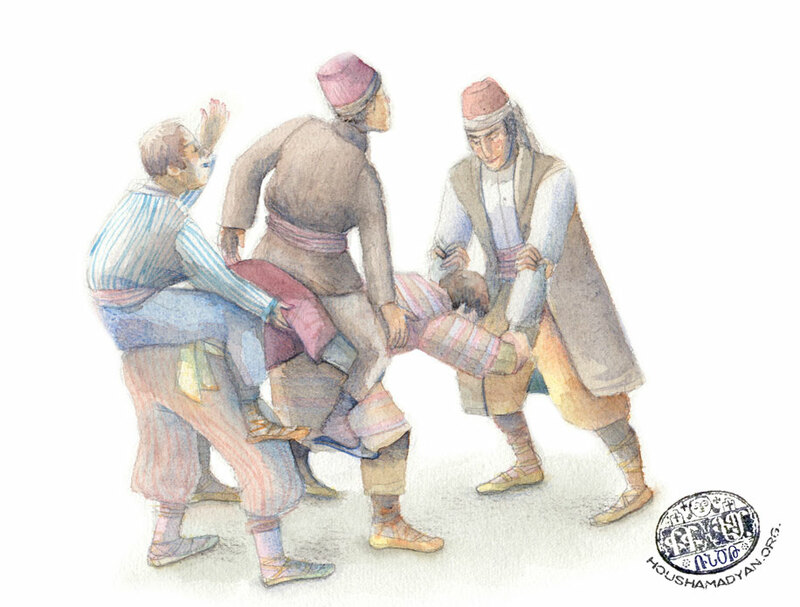 We cannot say, concerning the example of wrestling in Harput, that it refutes the above ideals, but at the same time it is also proof of the importance that this sport has in Armenian-inhabited villages. 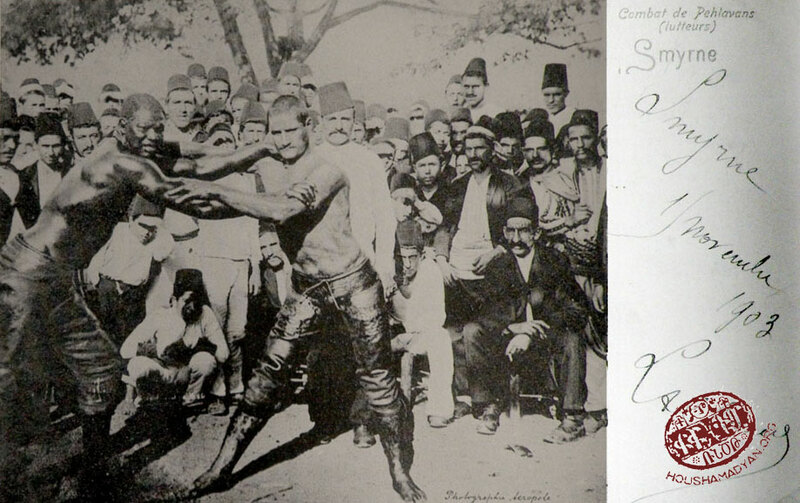 The best demonstration of this is that the Kurdish aghas of Armenian villages organise wrestling matches between the best wrestlers of two different villages, both of whom are Armenians, to settle differences between themselves. The competitions take place with huge crowds, the Kurdish aghas and policemen present. Many of these games are, however, simple pastimes. Apart from the classic top (hol) and checkers (dama), there are other games which require some explanation. The rich Armenian primary sources available concerning the villages of Harput give us the opportunity to present their various details. This is played by two competing teams. 12 coffee cups (findjan) and a ring are arranged on a tray. Lots are drawn to determine which side starts the game. A member of the team starting the game secretly conceals the ring under one of the coffee cups, and then the whole tray is put before the opposing side. Each member of the opposing side turns over a cup in turn. If the ring appears from under the last cup, then the side turning the cups over is deemed to have lost, losing a point, and the game is repeated. If, however, the ring is found earlier, then the game is won by the side turning the cups and it is their turn to hide the ring. Those looking for the ring always pay attention to the facial expressions of those who have hidden it. So the latter may use various theatrical movements or false expressions to fool their opponents. The prize is fixed before the game starts, and can be 3-4 baskets of grapes, half as litre of pears, or a tray of kadayif or paklava. The person whose eyes are to be covered is determined by playing hakul-hukul. The eyes of the chosen person are firmly covered with a handkerchief and the game begins. The person with their eyes covered has to find and hold one of the others. The person caught then becomes the one to have their eyes covered and the game resumes. 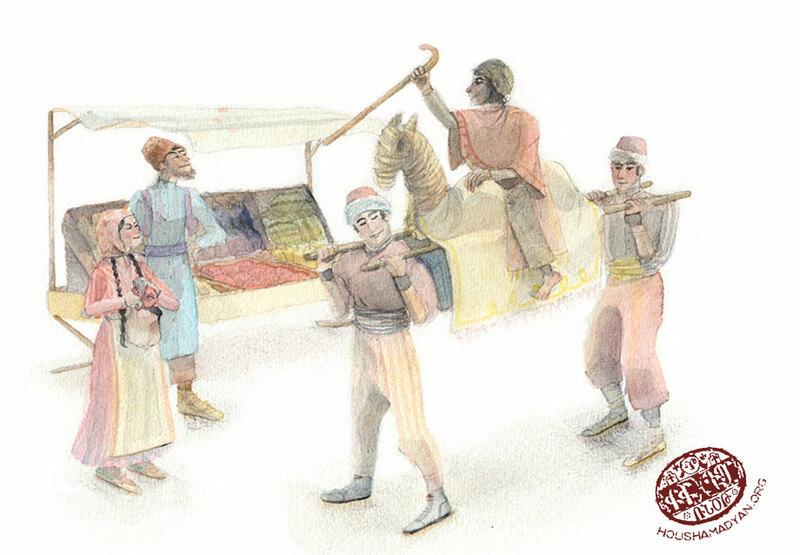 This is played in the yards in summer, and in the stables in winter, where there are many hiding places such as mangers and stalls, behind buffaloes and oxen, various places around the olive press, behind the circular press (ding), or under the raised floor that runs along one wall (saku) etc. The ‘seeker’ is determined by playing hakul-hukul. The person chosen hides his or her eyes with their hands and leans their head against a post and waits until their friends have hidden themselves. He or she then shouts ‘Have you done?’ – in other words has everyone hidden themselves? They must wait until someone shouts ‘It’s done!’ The ‘seeker’ then opens his or her eyes and begins to look for the others. When they see someone, they shout the person’s name and run to the post that they were originally leaning against and spit on it. The person found then becomes the seeker. If, however, the person found reaches the post first and spits on it, then he or she is free and the original seeker continues to find the others. Five small stones are essential. The player puts all five stones in the palm of his hand and scatters them on the ground, so that they are not too far apart, but fairly close together. The player then chooses one of the stones and keeps it in his hand. The chosen stone is called dada. She then throws it into the air, and swiftly picks up one of the others, so that she catches the dada stone before it falls to the ground. She must not touch or move the other stones that are on the ground when doing this otherwise she is considered to have lost the game and it is her playmate’s turn to play. In this way all the stones have to be collected in the palm of the hand. Once the player has successfully picked up all his stones, she then repeats the game, but picking up the stones in pairs (2+2). In the third round, she picks three up together and then the fourth (3+1) and in the final, fourth round, all of them at once. After completing this, the second stage of the game begins. The player creates a bridge with the thumb and index finger of her left hand on the ground. Then she scatters the five stones to the left of the bridge and chooses one which becomes the dada. This she throws up in the air with her right hand, at the same time quickly trying to bring out the stones out from under the bridge, without them touching each other, and catching the dada in the same hand before it falls to the ground. She throws the dada up a second time, at the same time swiftly pushing the stones under the bridge and catches the dada in the same hand before it falls to the ground. The last part of the game is to throw the dada up in the air with the right hand and swiftly pick up all four stones at once with the same hand, catching the dada in it too. This is played by two people. The person who starts is decided by drawing lots. 10 walnuts are needed for the game (knucklebones or small stones may be used instead of walnuts). Scoop out a depression in the ground about 15 cm (6 inches) in diameter. The person starting the game stands seven paces from the depression with the 10 walnuts in one hand and throws them in its direction. The number of them that have landed in the depression are then counted. If the number is even, the thrower wins. As his prize, he received the same number of walnuts from his opponent. If the number is odd, then the thrower’s opponent wins those in the depression and it is then his turn to throw. A circle of about 1.5 m (5 feet) radius is drawn on the ground and each player puts one or two knucklebones in the centre. The players determine a point outside circle from which each one will throw his sakka. This is the bone taken from the hind leg of a mature, fat sheep, and is quite large and weighty. Expert players drill holes in it and fill them with lead. This is played by either two people or two teams. Walnuts and knucklebones (vek) are needed. A circle is drawn on the ground about 1.3-1.5 m, (about 4-5 feet) in diameter. The diameter line is also drawn. Each player puts two walnuts next to each other on the line marking the diameter. The players stand in the centre of the circle near the walnuts and throw their knucklebones forward at the same time. The bones they throw must land outside the circle but as close to its edge as possible. The winner of this first stage in the game is considered to be the one whose knucklebone has landed on the zil side. If more than one of them has fallen on the zil side, then the winner is considered to be the one who owns the one nearest the centre of the circle. The players whose bones fall on the tam side are automatically considered to have been beaten and lose their turn. If all the thrown bones fall on the tam side, then the winner is considered the person whose bone is nearest the centre. The order of play of the second part of the game is as follows: (a) the owner of the bone that has fallen zil side down nearest the centre of the circle; (b) then the owner of the second nearest, then the third and so on; (c) the owner of the bone that has landed tam side down nearest the centre of the circle; (d) then the owner of the second nearest, then the third and so on. The first player stands at the point where his bone landed, picks it up and throws it towards the walnuts on the diameter line, trying to hit them and by doing so eject them from the circle. If he succeeds, then not only does he win the nut that has landed outside the circle, but the game also resumes from the point where the thrown bone has landed. His turn continues if his bone falls on the zil side, even if he fails to get the walnuts out of the circle. If, however his bone falls on the tam side, then it becomes the next person’s turn. The game continues until all the nuts are removed from inside the circle. This game is played by two players. The players sit facing each other. Each places two veks on the ground such that one touches the back of the other. This is played by two competing teams, each consisting of about ten older girls and young married women. This game is played by two competing teams. A small depression is opened in the ground. The chanch, bridge-shaped piece of wood with sharp ends and about the size of a palm, is settled over it. One of the teams throws the chanch, the other catches it. A member of the throwing team, holding the end of a stick about 1m (3 feet) long, inserts the other end into the pit, under the chanch. Then the chanch is thrown upwards using a strong thrust of the long stick. The catching side stand at a distance opposite the thrower. Holding their skirts wide, they wait for the chanch to descend. If one of them manages to catch it in their skirt, their team wins, and it is then their turn to play. ‘Mother’ and ‘chick’ are decided by using the ‘stone-holding’ way of drawing lots. 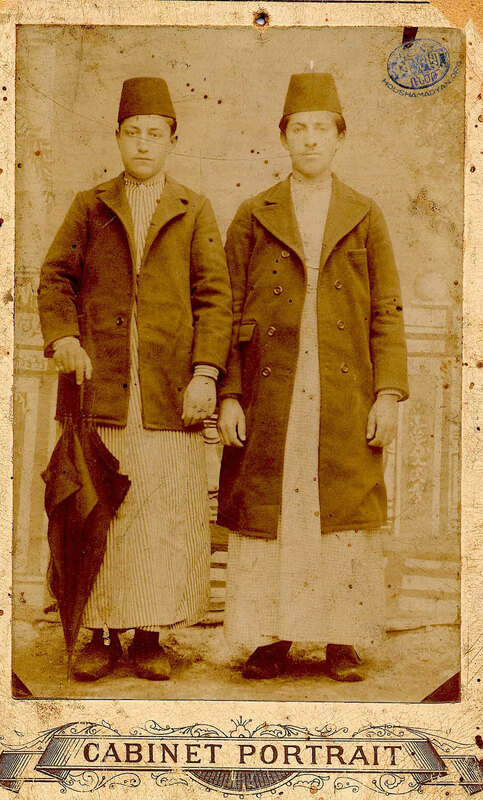 The person playing the ‘chick’ squats down, while the ‘mother’, holding on to the end of the ‘chick’s’ belt or the hem of the zebun (long dress or coat), in other words the ‘tail’, turns around it. The other players surround the ‘mother and chick’ and try to hit both. The ‘mother’ has to try to kick those surrounding her, without however letting go of the ‘tail’. The first person to receive a kick by the ‘mother’ becomes the ‘chick’, while the chick takes the ‘mother’s’ place. 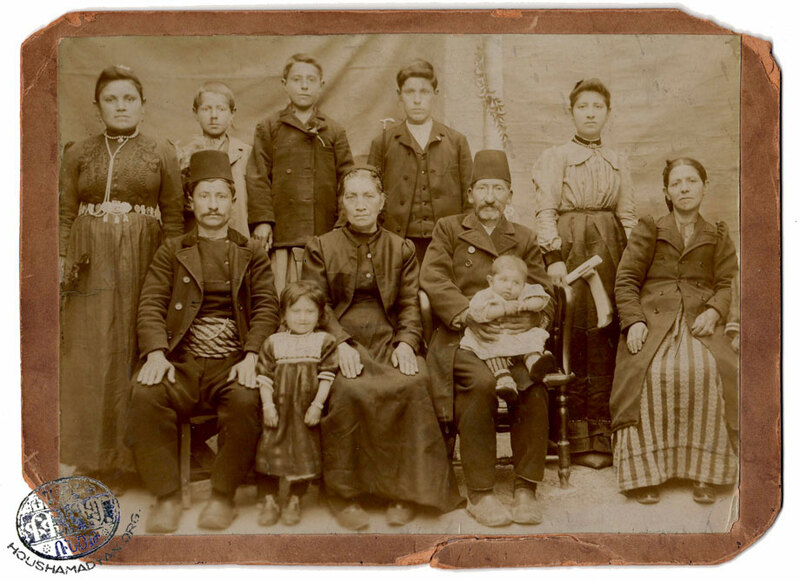 The first aylekh tsik (player with the handkerchief) is decided by using the ‘stone-holding’ way of drawing lots. The other players squat down in a circle with their backs outwards and their faces inwards. 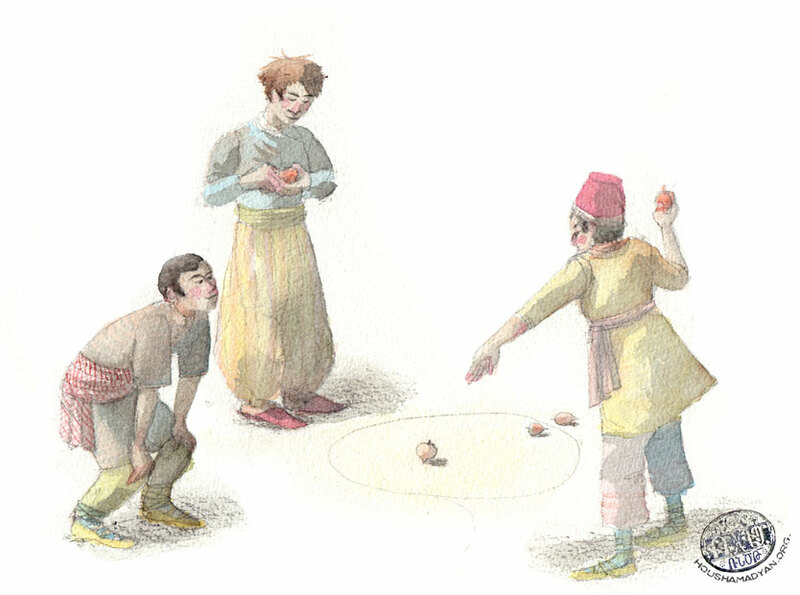 The chosen player (the aylekh tsik), with a handkerchief in his or her hand, begins to circle those squatting. He or she finally chooses the target person and secretly puts the handkerchief behind them. The chosen player circles the others once more and if the target person still hasn’t noticed the handkerchief behind them, he or she grabs the target person and climbs onto their back. The circling player is then considered to be the victor and squats in the target’s place; the target person becomes the new aylekh tsik. It can, however, happen that the person receiving the handkerchief notices what has happened; he or she then immediately gets up and runs after the aylekh tsik, attempting to grab him or her before the latter takes his or her place in the circle. If he or she is successful, the pursuer gets on to the aylekh tsik’s back, then returns to his or her place in the circle and the original aylekh tsik continues in his or her role. It is played either on the roof or in a yard with a level floor, as the play area must be greater than 15-20 square feet (1.4-1.8 sq m). A diagonal line is drawn across one corner of the play area: this becomes the pon (nest). First the team leaders choose their teams by using the ‘stone-holding’ way of drawing lots. The same method is used to determine which team enters the pon, in other words must remain in the area behind the diagonal line. The other team remains outside it. The first player comes out of the pon and, hopping on one leg, begins to chase the members of the other team. Only one ‘chaser’ can play at a time. When he succeeds in touching someone in the opposing team, then that person becomes a tes and retires. If however, the hopping ‘chaser’ puts his raised foot on the ground, he becomes a tes and stops playing. This game is usually played by young men. Two people are drawn by lot to play, and must sit on the ground opposite one another, with their legs extended and the soles of their feet pressed together. The other players take it in turns to jump three times over their legs. On the fourth occasion, the barrier is raised by one of the seated players by raising one leg and putting the heel of that foot on the toes of that of his companion. The other team continues to jump. On the next turn, one of the seated players raises the barrier still further by putting the heel of his foot on the toes of the raised one. Finally the fourth foot is added. The people jumping must not touch the raised legs. If a player does, then he sits down, replacing the previously seated player, who then joins those who are jumping. The zarazamba, which in this instance is the name of the player, is chosen by the hakul-hukul method. A stake is driven into the ground, to which a 10 feet (3m) long rope is tied. The zarazamba keeps hold of the end of the rope and circles round the post. Each of the other players removes his belt and, having tied one end into a knot, throws it near the stake. These kinds of knotted belts, as we have seen, are called tulla. The free (outside) players have to try to lay their hands on the tullas. The zarazamba, always retaining his grip on the rope, has to protect the tullas. He can only hit an approaching player with his feet. The person hit then becomes the zarazamba. If, however, the free (outside) players manage to get a tulla without getting hit, he then has the right to hit the zarazamba with that same belt. All the blows must be below head height. If someone hits the zarazamba’s head, then he becomes the zarazamba as a punishment. The two players must sit on the ground opposite one another, with their legs extended and the soles of their feet pressed together. Both of them hold on to a stout stick about 1 inch (5 cm) and 2-2.5 feet (60-75 cm) long. The game begins with each player trying to pull the stick his way. The winner is the one who finally gets the stick. The game consists of throwing a large stone with one or two hands as far as possible. A place is selected from where the stone will be thrown. The game is played in four different ways. - The stone is thrown with both hands. The feet may be moved at will. - The stone is thrown with both hands. The feet may not be moved. The stone thrown with both hands is the heaviest. It may weigh up to 110-130 lb (50-60 kg). - The stone in held one hand and raised to head height then thrown taking a step forward. - Turning and throwing the stone with both hands between the legs. This is a game played during feast days such as Easter. It takes place on an open field. Each team has its ‘house’, in which it keeps its ‘fire’. None of the books on Harput describe what this fire actually looks like. It is probably just some object. The defending team protects its ‘house’, while the opposing one tries to enter it to steal the ‘fire’. The defenders carry tullas. The person who steals the ‘fire’ immediately rushes back to his team’s ‘house’. But one member of the defending team has the right to pursue the ‘thief’. He must run fast, catching up with the ‘thief’ before he enters the ‘house’. If he succeeds, then he can give the ‘thief’ a good beating with his tulla, right up until the time he enters his ‘house’. The former defenders then become the attackers, trying to steal the ‘fire’ in their turn. This game is played by two competing teams, each of 4-5 players. The team to start is chosen by the ‘wet-dry’ stone method. The team that loses the toss of the stone forms a line of bent backs and heads. This is done as follows. Only the first member of the team doesn’t bend down, but stands erect with his back to a wall. The second player bends down and puts his head in the erect player’s stomach, using it as a support. 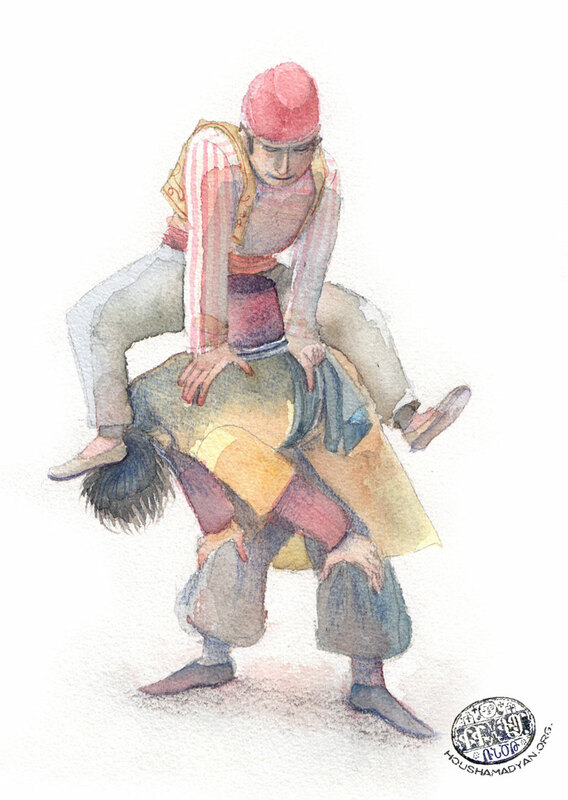 The standing player holds him firmly by the shoulders, so that the chain of backs is firm. 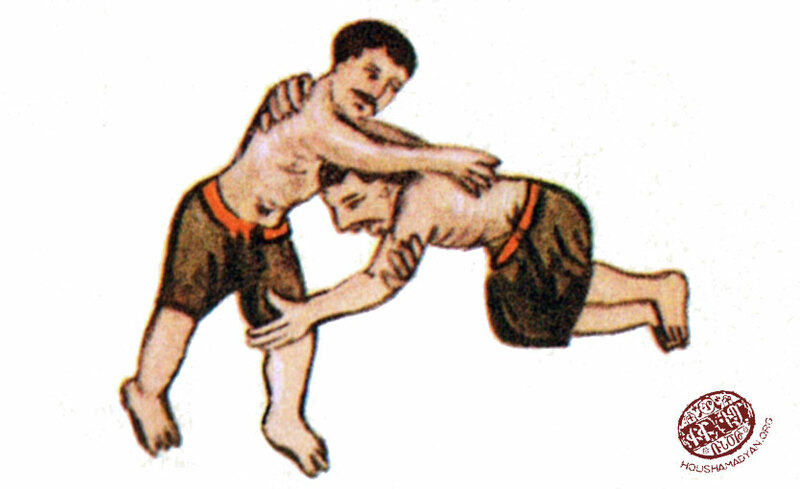 The third player also bends down and puts his left shoulder against the rear of the second player, gripping him tightly around the hips with the left arm. The fourth player (and possibly the fifth) does the same. Thus a straight line or chain of four or five players is formed. The other team begins the game. From about ten paces distant the first player runs towards the rear of the chain and throws himself onto it, hoping to get as far forward from the end as possible, without falling off. He immediately begins to count to 20, 50 or 100, as previously agreed. His three or four team-mates do the same, also counting as they land on the backs of their opponents. If any one of the people who jumped on either falls off or touches the ground with his foot, the team loses and changes places with the other. It is usually played at the beginning of spring, in dung hollows. The members of the teams are determined by drawing lots. Teams of equal numbers (between 5 and 10 players) are formed. The team leaders choose the members of their teams. The first ‘chooser’ is determined by the ‘stone-holding’ method. The team members are then chosen alternately in turn by the team leaders. Each team takes up a position on a particular spot which is called khala (castle). There must be about 50-60 paces distance between them. The attacking team is chosen by using the ‘wet-dry stone’ method. The attacking team chooses its advance guard, who is preferably a swift runner. He first goes towards the opposing khala, thus starting the game; he then tries to get back to his own team’s castle. But the opposing team sends out one or more pursuers. Their aim is to touch the advance guard, thus preventing him from entering the khala. At the same time those in pursuit have to be very careful, as the pursued advance guard’s team members have the right to hit them and bring them into the khala as prisoners. It is enough for one of the pursuers to touch the advance guard to have him considered to have been removed from the game. In that case the same team sends a new advanced guard. If he does succeed in entering his khala, then it is the opposing team’s turn to despatch an advance guard. The game continues until one khala is emptied. It is also called the ‘castle game’, and is played by two competing teams. Teams of equal numbers (between 5 and 10 players) are formed. The team leaders choose the members of their teams. The first selector is determined by the ‘stone-holding’ method. The team members are chosen alternately in turn by the team leaders. A flat stone is placed in the middle of the field of play. This represents the castle. One of the teams becomes the castle defenders, the other the attackers. The defending team is chosen by using the ‘wet-dry stone’ method. The defenders gather around the flat stone, which they have to protect against the other team’s attacks. They also make sudden forays on the attacking team, trying to touch them, making them tes – in other words to put them out of the game. But they take care never to venture far from the ‘castle’, because the attackers could capture it. How is the castle captured? If one of the attacking team touches the flat stone without being struck by the defenders, the castle is considered to be captured. The attackers can’t make a defender tes – out of the game. They can only try to make them djer, in other words to get them away from the stone and capture the castle. The best way for the attackers to capture the castle is to launch pairs of attacks from various directions, so as to make the defenders as confused as possible. So, while one of the attackers approaches the castle and tries to get the defenders to concentrate on him, at the same time one of his team-mates tries to touch the flat stone. Harput melons are striped green and white. They are harvested during the summer and piled up in cool places to be sold. Buffalo fighting is a great spectacle in some Harput villages, taking place on feast days such as Easter and Paregentan. The strongest and biggest animals are sought for this game, and are often called by Harput pet-names given to such animals like Tosun, Arab, Toroman, Aslan, Boro, Bashsho, Khumash and Tikko. The animals reserved for fighting are given extra care by the village. As food (in local dialect alig) they are given kusha (lathyrus tuberosus), govdun and gruel. They are given the best quality cold water from the fountains and streams. They bathe in those waters too. In other words there is a concerted effort by the villagers to keep these animals well and strong as a prelude to the day of the fight. A comic game played on Paregentan days. 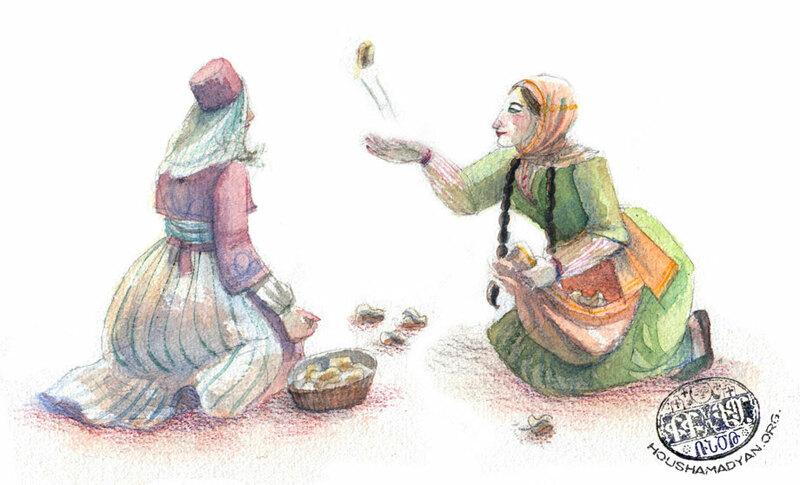 Do you know other games played in the plain of Harput, how they were played and their rules? Do you have additions or objections to the information contained in this article? It is imperative that you give us your name, surname and the source of your information in your letter. Dzeron, Complete history…, p. 130. Shahbazian, Our Tankaran village..., p. 44. Dzeron, Complete history…, p. 154. Shahbazian, Our Tankaran village..., p. 45. Dzeron, Complete history…, pp. 154-155. Dzeron, Complete history…, p. 155. Ibid, p. 156; Shahbazian, Our Tankaran village..., p. 42. History of Habus village…, p. 65. 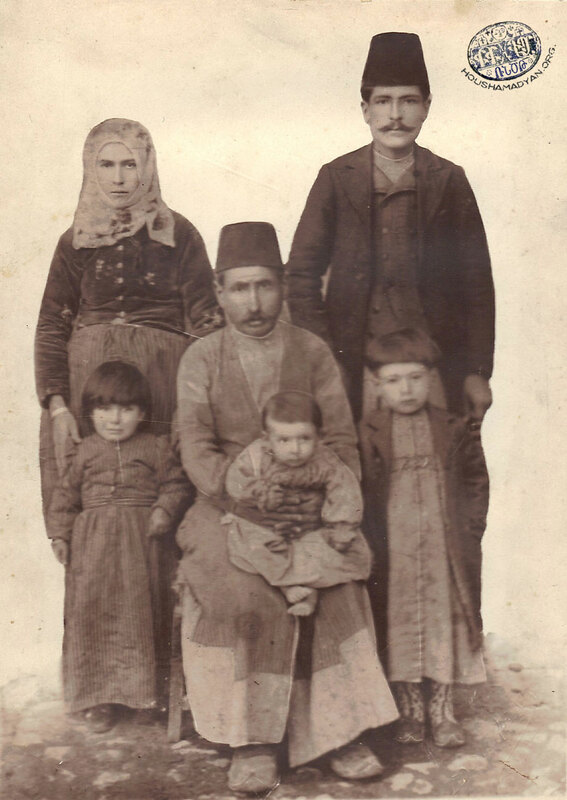 Shahbazian, Our Tankaran village..., p. 43. Dzeron, Complete history…, p. 156. Boghosian, Comprehensive history…, pp. 64-66. Dzeron, Complete history…, p. 158. Shahbazian, Our Tankaran village..., pp. 38-39. Boghosian, Comprehensive history…, p. 64.